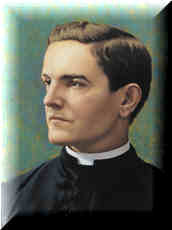 The Knights of Columbus was founded in 1882 by a 29-year-old parish priest, Father Michael J. McGivney (pictured),in the basement of St. Mary's Church in New Haven, Connecticut. Today, more than a century later, the Knights of Columbus has become the largest lay organization in the Catholic Church. The Order has been﻿ called "the strong right arm of the Church," and has been praised by popes, presidents and other world leaders, for support of the Church, programs of evangelization and Catholic education, civic involvement and aid to those in need. As recently as 1992, Mother Teresa of Calcutta praised the Knights in a speech on the occasion of her reception of the first Knights of Columbus Gaudium et Spes Award. Thanks to the inspired work of Father McGivney - as well as that of millions of other Knights over the past century - the Knights of Columbus now stands at its pinnacle of membership, benefits and service. Currently, there are over 1.8 million Knights of Columbus - more than ever before in our Order's history. Together with their families, the Knights are nearly ﻿6 million strong. In addition, from the first local council in New Haven, the Order has grown to more than 14,000 councils in the United States, Canada, the Philippines, Mexico, Poland, the Dominican Republic, Puerto Rico, Panama, the Bahamas, the Virgin Islands, Cuba, Guatemala, Spain, Lithuania, Ukraine, and South Korea. Each year, the Order continues this strong growth.